About 5 minutes and 52 seconds reading time for this 1.4K word page. Many federal and state agencies are involved in responding to Presidentially declared major disasters under the Robert T. Stafford Disaster Relief and Emergency Assistance Act of 1974 (the Stafford Act). Grantees must be aware that the Supplemental Appropriations Act authorizing CDBG funding or the Stafford Act may include restrictions on using those program funds to provide assistance when insurance providers or other federal or state agencies have already funded all or a portion of the activity. Note: See exhibit 2-5 for DOB policy and exhibit 2-6 for sample DOB policy for adoption by grantees and subrecipients. Certain Supplemental Appropriations Acts also include restrictions against use of those program funds as a matching requirement, share or contribution for any other federal program. The Stafford Act also contains eligibility requirements for recipients who have received prior disaster funding based upon whether or not they are in compliance with requirements associated with receipt of those funds. Where applicable, recipients must be in compliance with these restrictions or individual funding will be denied. The Robert T. Stafford Disaster Relief and Emergency assistance Ac (Stafford Act) requires that recipients of federal disaster recovery funding make certain that no "person, business concern or other entity" will receive duplicative assistance. Because disaster assistance to each person/entity varies widely based on their insurance coverage and eligibility for federal funding, grantees cannot comply with the Stafford Act without first completing a duplication of benefits (DOB) analysis specific to each applicant. The assistance amount exceeds the need for a particular recovery purpose. 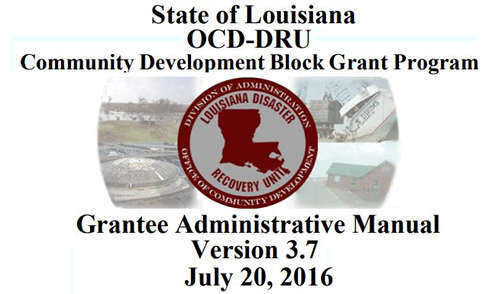 In response to hurricanes Katrina, Rita, Gustav, Ike and Isaac, the State of Louisiana received supplemental disaster recovery assistance through HUD's Community Development Block Grant (CDBG) Program. This assistance is intended to supplement, not replace, other public, private and nonprofit sector resources that have already been provided for the same need or loss. For example, if a family's damaged home costs $100,000 to repair and the homeowner received insurance proceeds in that amount, the homeowner could not also receive federal disaster recovery funds to repair the home. Grantees should ensure that each program provides assistance to a person or entity only to the extent that the person or entity has a disaster recovery need that has not been fully met by funds that have already been, or will be paid, from another source. 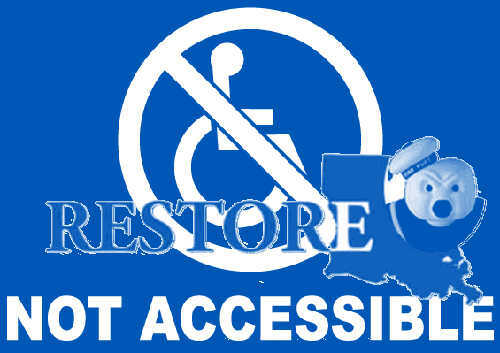 The purpose of this document is to outline how the State of Louisiana, Office of Community Development / Disaster Recovery Unit (OCD/DRU) assures that all applications for assistance from the programs funded by OCD/DRU (both housing and non-housing), as well as all projects implemented by OCD/DRU grantees, contractors and subrecipients, will be reviewed for possible duplication of benefits. The procedures described below are also applicable to all OCD/DRU grantees and subrecipients, and must be incorporated in the design and administration of programs / projects undertaken by them. The first step of the DOB determination (calculation) is to determine the amount of assistance needed and the amount of funds previously received, or to be received, for a disaster recovery activity. This is accomplished by first determining the applicant's post-storm disaster need prior to the receipt or potential receipt of other funds. Next, all other sources of recovery assistance received, or available to be received, must be disclosed during the application process and must be verified. Other sources of funds include, but are not limited to: private insurance, the Federal Emergency Management Agency, the Small Business Administration (SBA), the National Flood Insurance Program local and state funds, other federal programs, and private and nonprofit organizations. The next step is to identify assistance that is not available for the activity. This consists of: funds received that are not for the same purpose as the CDBG activity(s); funds not available to the applications, eg. forced mortgage payoff, contractor fraud, etc. ; funds from private loans not guaranteed by the SBA (forgivable loans are duplicative); and any other asset or line of credit available to the applicant, such as checking and savings caccounts, stocks, etc. 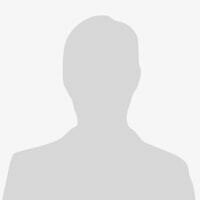 These funds are not considered to be duplicative and may be excluded from being deducted as a duplication of benefits. Finally, after subtracting from the proposed activity cost the duplicate funds received or available to receive, calculate the maximum CDBG award. Once the maximum CDBG award has been determined, applicants will be required to sign an agreement (either subrogation or Cooperative Endeavor Agreement) requiring them to return to OCD/DRU any assistance received for the same purpose as the CDBG disaster recovery funds. This agreement is to be monitored by OCD/DRU program staff, grantees and subrecipients at least annually for three years. Unless an additional need is established, disaster recovery funds must be recaptured to the extent they are in excess of the need and duplicate other assitance received by the beneficiary for the same purpose. Disaster recovery assistance needs are calculated at a point in time. As a result, subsequent circumstances may occur that affect the need. If, after the assistance has been calculated and/or a CDBG award has been made, an applicant can demonstrate a change in circumstances the award calculation may be subsequently reevaluated to take the increased need into consideration. Such changes in circumstance include: vandalism, contractor fraud, an increase in the cost of materials and / labor, a change in local zoning law or building codes, or subsequent damage to a home or business that was partially repaired. However, the reevaluation must be done before the initial need for which assistance was granted has been fully met (e.g., before a damaged house is fully repaired). The federal regulation pertaining to this OCD/DRU policy and procedure for identifying Duplication of Benefits is found in Federal Register / Vol. 76, No. 221, November 16, 2011, which should be reviewed as part of determining Duplication of Benefits. The process for identifying and then monitoring for DOB begins with the review of each grant application, whether it is for a specific project or an individual beneficiary of disaster recovery CDBG funds. An applicant must provide detailed information about other sources of funds that were received or that may be received related to the activity for which CDBG funds are being requested. OCD/DRU staff review and verify the other funds to determine if they are for the same activity and exceed the need for recovery assistance. Once CDBG funds are awarded, minus any determined to be a DOB, applicants are required to notify OCD/DRU of the receipt of any additional funds received for the same activity. Program staff review individual pay requests and project amendments to determine if other funds have been received that represent a DOB. In the event that additional funds are determined to be a DOB, funds will be withheld from future pay requests, and the approved project budget will be amended. In the event that all funds have been expended and a DOB is identified, the applicant will be required to repay the funds to OCD/DRU for return to the U.S. Treasury. Monitoring for duplication of benefits will also be incorporated into OCD/DRU monitoring policies and procedures.